Hope you are well. I’d like to place on order 10 copies of next year’s lectionaries please. Diana did offer to collect them for me when she’s at the Diocesan office. Also, our school purchased a Provincial Stewardship Resource booklet with the accompanying Bible Study guides -(5 copies) and a Confirmation register which we haven’t payed for as yet. Please could you send me an invoice for these. Thank you for your message. we will send a quote of the amount due. I will check on the other items and arrange to send the invoice. 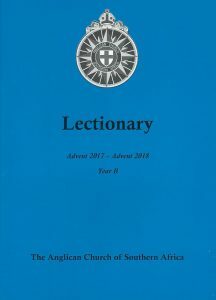 My Sister I need your help to send me the lectionary 2018 by email as possible as you can. Hope you are having a blessed morning. Just a quick question about the Lectionary 2018. Do we have a online Lectionary. I do the Pew Slips at our Parish and every week in the Pew, I add the Daily Morning and Evening Readings. I have to type this out weekly, which is a little time consuming. If not, is there any easier way for me to attain the readings. May this day offer you just what you need in each unfolding moment. My apologies for the late reply. We unfortunately do not have an online edition of the Lectionary. Thank you for your message. Yes we do have them. I will ask the Orders office to take your request further. Is there any way of getting on online lectionary please. If we are to move our church forward, I think we should make every effort to embrace technology and make an electronic version available. Apologies for this late response. I am afraid the Lectionary is not available on line. this matter is under discussion by the Liturgical and Publishing Committees. We do have copies still available at R10 each. Let me know how many you need and we will send a quote. Orders are sent on receipt of payment. A quote has been sent to your email address.